Here’s what’s hard to believe: Jack Daniel’s has never released a barrel strength whiskey. 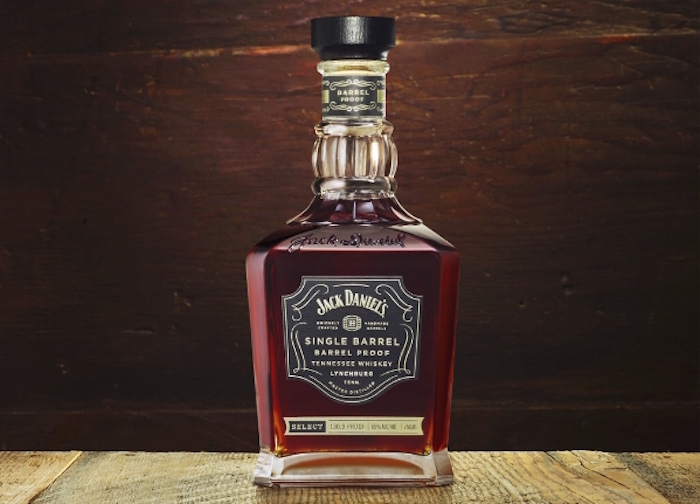 That’s changing, with the release of Jack Daniel’s Single Barrel Barrel Proof, the company’s first-ever cask strength offering. The whiskey isn’t a terribly complicated idea: Take the JD Single Barrel Select (which we only just reviewed a few weeks ago) and don’t water it down. Single Barrel is a consistent 94 proof, but these are bottled at whatever the cask gives you, ranging from 125 to 140 proof, depending on the bottle you get. Naturally, we can only review the sample we received, and individual bottles are going to vary widely. As for this bottling, it’s an easy winner. The nose offers maple syrup, caramel sauce, and a little barrel char. On the body, it doesn’t drink like something that is 2/3rds alcohol. In fact, it really needs no water at all to be approachable, though less seasoned whiskey drinkers may want to add a splash. The palate is rich with more of that caramel, butterscotch, a touch of cloves and a lengthy, vanilla-fueled finish. Big, bold body — but it’s not overpowering in the slightest. The char isn’t overly evident here, which lets the sweetness really shine. All told, it’s a fantastic whiskey that stands as arguably the best thing ever to come out of the JD empire. Reviewed: Warehouse 2-45, 4th floor. 133.7 proof. No surprise that Jack Daniels makes a delicious whiskey! Will definitely have to give this one a try – sounds like a bold flavor. Where can you find this barrel proof release. Ive tried many distributors who are not even aware of it. Probably still making its way to market as it was only released this month. Keep checking on it. You ever use an axe to keel ennybuddy? Have been trying to find since I got the e-mail in July. I am in Minnesota, anybody have any clue where to find this???? your better off finding it online than from your local liqour store at this pt. try internet wines . com (explicitly search for it rather than browse whiskey selection) or potomac wines and spirits. They have stock. if they ship to your state, your in luck. Thank you jack Daniels I’m going to get me a bottle tomorrow . Crazy good!! I sampled it here in Knoxville TN. at my favorite liquor store. They purchased a barrel. In the past all the special Jacks still had that wildness to the taste. This was different! It was smoother & rounder than anything I’ve ever tasted from them. I was impressed & the price was under $50.00. Thirty-two years ago I worked next door to the dry county (Moore) where it all began. And I’ve enjoyed JD (outside of Moore County, and Coffee Co., next door too) ever since. And I thought that when Single Barrel came along, it was the last word. I knew that after barrel aging, when the batch was ready for bottling, it was was “blended-down” to both a proof; and, a palette that were optimized to the exacting standards and consistency of a global manufacturer/distiller. Although I think you can taste a difference between bottling in glass; and bottling in PET (used on the airplanes, trains, and in hotel mini-bars) . But JD Barrel Proof; is proof, that straight from the barrel, JD can stand on its own. I liken it to the difference between a “mild cure” and a “traditional cure”, Genuine Smithfield Country Ham; its much richer in flavor, and should be savored, differently. Like the genuine Country Ham, JD Barrel Proof is worth driving all over town today to find it. My recommendation is to always chill the chaser, and its glass if used. But never chill either Whiskey or the fine crystal; heavy wide-mouth tumbler, into which the JD Barrel Proof is poured. Small shots only; and never more than one, at a time into the glass. Savor the aroma and the color, and let the hand (holding the glass) gradually warm the shot, while drinking. That’s why its called Tennessee sippin’ Whiskey. You use your tongue better’n $50 Kansas City whore!